Basketball season is in full swing, and the women’s team is off to a strong start. 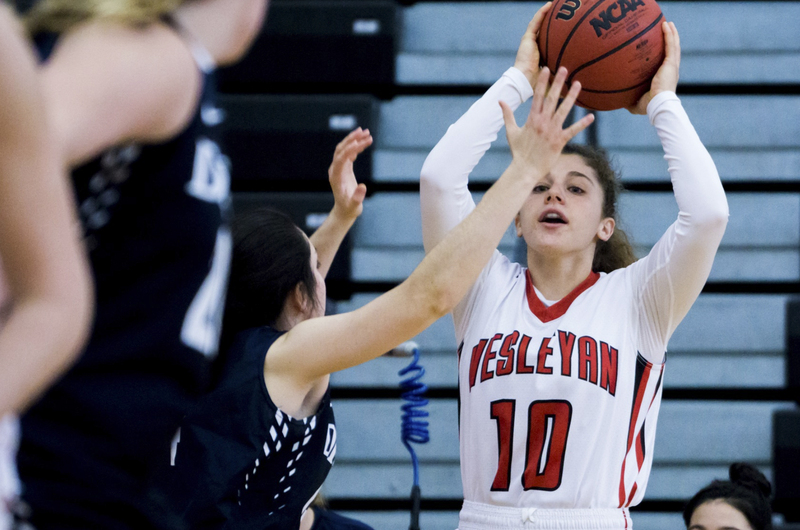 There have been three games this season, and although Wesleyan started with a 69-61 loss against Cabrini University at Swarthmore College on Nov. 16, they made it up the next day beating Swarthmore on the road 82-59. Then, the Cardinals followed up that decisive victory by defeating Medgar Evers College 84-38 on Nov. 20. Unfortunately, the game scheduled for Nov. 25 against Drew College was canceled and rescheduled to a future date. There were some bright spots in the loss to Cabrini. During that game, the Cardinals’ captain Tara Berger ’19 led the game in points and rebounds. She was named NESCAC Player of the Week for her outstanding performance all throughout the weekend. Berger, a forward, had an excellent game, posting a double-double with 22 points and 16 rebounds. Another bright spot in the Cabrini loss was the guard Ava Tompkins ’20, who also had a notable game with three assists. Also, first-year guards Maddie Clark ’22 and Marina Petruzzi ’22 each found a way to score in their first college game. The Birds were behind from the start as the Cavaliers scored the first five points of the game, but when the Cardinals went on a 5-0 run, a layup by Berger cut the Cavaliers’ lead, putting Wesleyan behind by only one with a score was 11-10. Cabrini kept the lead all half, winning at the end of the second quarter 32-28. It looked like the Red and Black could make a comeback in the third quarter when they opened on a 10-1 run, winning the Cards’ first lead of the game and putting the score at 38-37. The Cardinals entered the fourth quarter in the lead, 50-44, due to a three-pointer by Emma Roush ’21 with 35 seconds left in the third quarter. The Cavaliers took back the lead in the fourth quarter and maintained it until the end of the fourth quarter, handing the Cards a 69-61 defeat. The Red and Black recovered from the loss to Cabrini and came back to win their next two games in dominant fashion. Berger had another noteworthy game, earning her NESCAC Player of the Week. She posted a second consecutive double-double, scoring 18 points and grabbing 14 rebounds. She added four assists, four blocks, and two steals to an impressive stat line. Other leading players in the Swarthmore game included guard Caleigh Ryan ’22 with 19 points and guard Chynna Bailey ’19 with five assists. The Cardinals started off the game strong by scoring the first six points and by the end of the third quarter had built an impressive 23-10 lead. At the beginning of the second half, the Cards effectively shut down Swarthmore and ultimately went ahead by 28 points. Wesleyan’s biggest win yet was against Medgar Evers. Five Cardinals scored in the double digits, and Berger recorded her third double-double of the season with 10 points and 11 rebounds. Olivia Gorman ’19 led the team with 17 points. The Cardinals have made a habit of scoring the first points of the game, putting themselves in a great position from the start. By the end of the first quarter, Wes had a 21-14 lead and was winning 40-27 by the end of the half, making the chances of the Cougars catching up increasingly slim. The Red and Black started the second half with a 10-0 run and ended the third quarter leading 65-33. The Cards led all night and eventually blew-out their opponent 84-38. The Red and Black are poised to have a very strong season, and the team is playing with confidence. The team is now 2-1 overall. It will be a few weeks until the Birds play a conference opponent, likely by design. Many NESCAC coaches schedule soft out-of-conference match-ups to prepare their squads for the trials of rival match-ups. The Cardinals play again on Saturday, Dec. 1 at home against Marywood University and then again on Wednesday, Dec. 5 at home against Endicott College. It would be great to show this talented team your support, so come out to watch this exciting team. Alissa Dobrinksy can be reached at adobrinsky@wesleyan.edu.